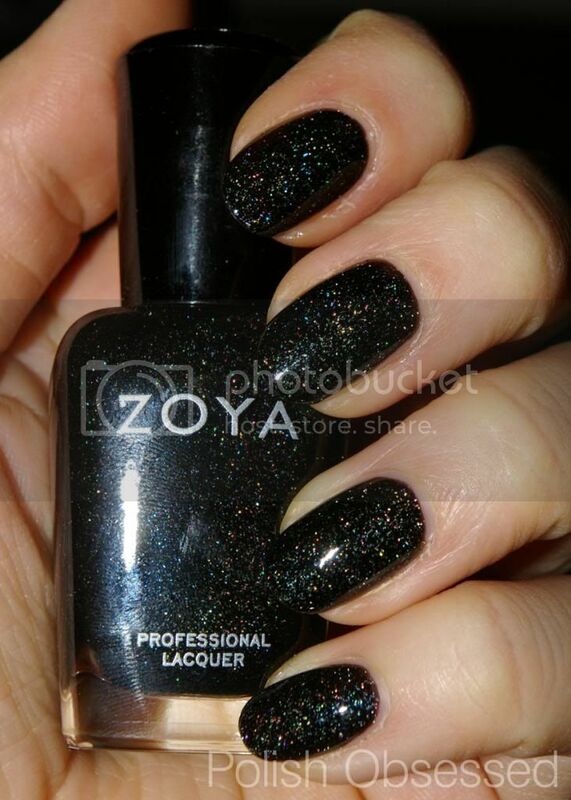 Storm is a black jelly-ish base with irregular shaped holo glitter flecks. The glitter pieces appear silver in low light and rainbow blingy in sun and direct lighting. I'm not sure if the base is considered a true jelly, but it sure does dry to a high gloss finish and let the glitter pieces really shine through. Application was a breeze, the first coat went on thin and streaky, but the second coat evened out any minor imperfections and streaking from the first coat. Two coats is all I needed for full opacity. I let it dry for a few minutes before applying my rediscovered, totally awesome top coat, NYC In A New York Minute Quick Dry, Grand Central Station. I love this because it is super thin, applys evenly and dries quickly to a high gloss shine. Did I mention it's only $1.99? Best drug store brand of topcoat EVAR! I just wish they came in larger bottles, oh well, can't be picky! The glitter in Storm when compared to the other Zoya's with the same finish (Aurora, Blaze, Dream) does not appear to be as large which results in slightly less sparkle. Since it has been gloomy the past few days I have only really seen the silver sparkle which comes out, suits the weather well I guess. I've seen a lot of nail blogs out there on the interwebs and I've been lurking in yours for a while now... I just HAVE to tell you that your nail shape (whether they're long or short) and application are pretty near the top in my books. You do good work, lady. Aww, thanks, you are too sweet :) I really appreciate you taking the time to read and comment on my blog, I am a fan of your blog as well! Hey lady, I added your site to my last two Rafflecopter giveaways. Your BlogLovin followers have gone from 125 to 150 as of tonight. It is pretty, but for some reason it didn't wow me like it did when I first saw swatches of it. I wish it had a more jelly base and more glitter!